Initially a middle-distance runner, Ferreira helped Du Toit make use of his natural speed by dropping down in distance. Sitting in front of a few hundred supporters in the arrivals hall at OR Tambo International Airport, Charl du Toit stops smiling for a few seconds as he wipes away a tear. Ironically, in the moment his ever-present grin fades, he is the happiest man in the room as he soaks in the deserved adulation for his double victory at the Rio Paralympics. Du Toit hardly ever stops smiling. Even his voice emits a cheerful tone, and if you were talking to him over the phone, you’d picture him grinning ear to ear. Born with cerebral palsy, he got a raw deal from the start, and he could probably think of countless reasons not to stay positive and retain the drive that carries him through a rigorous training regime. Instead, he makes use of the abilities he has at his disposal, puts in the hard work and reaps the rewards. When he goes down in the blocks, the smile vanishes for a short while as he switches to sprint mode, but as soon as he completes a race, his grin springs back into action as if it’s attached to an elastic band which triggers as he crosses the line. As harmless as he may seem off the track, for that short period when his expression becomes serious and he glares down his lane, Du Toit transforms into a speed machine as his mind grapples for control of his body while he blitzes down the home straight. The 23-year-old speedster, who competes in the T37 class for athletes who have coordination impairments on one side of the body, has become so formidable he seemed unbeatable at the Paralympics last week, charging to two gold medals and a new world record. But it’s been a long road to the top, and he points out he has received some crucial assistance along the way. 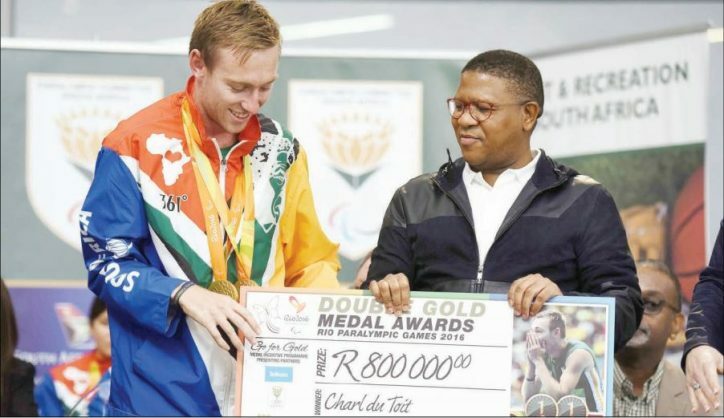 “I wish I could take these medals, break them into small pieces and give them away to all the people who contributed to my career – my coach (Suzanne Ferreira), my family, my team-mates,” Du Toit said after arriving home with the rest of the national Paralympic team on Tuesday. He also thanked Stellenbosch University and Maties Parasport, as a product of their high-performance programme, and the SA Sports Confederation and Olympic Committee (Sascoc) after he was included in the Operation Excellence programme for funding and support in 2012. “Medals are earthly things but the memories created mean so much more and I’m thankful for all the people who have invested in me,” he said. After completing matric at Hoërskool Akasia in Pretoria in 2011, Du Toit packed his bags and headed for the Western Cape where he joined the country’s top para-athletics sprint group based at Stellenbosch University, which also includes Paralympic stars Dyan Buis, Fanie van der Merwe, Arnu Fourie, Ilse Hayes and Anrune Liebenberg. Making his Paralympic debut as a teenager at the London 2012 Games, shortly after linking up with Ferreira, he was still in a transitional phase and was eliminated in the 100m heats before finishing sixth in the 800m final. The following year, at the IPC World Athletics Championships in Lyon, he stepped on the podium for the first time at a major global championship, earning bronze in the 400m and 800m events. At the 2014 Commonwealth Games in Glasgow, he went on to grab the 100m silver medal behind training partner Van der Merwe, and at last year’s world championships in Doha he bagged 400m silver. This season he catapulted his career to new levels by stamping his place as the top performer among Ferreira’s stellar group of speedsters who between them contributed eight of the nation’s 17 medals at the Rio Games. After charging to victory in the 100m and 400m finals, and setting a global best of 11.42 in the heats of the short sprint, Du Toit said there was plenty left in the tank as he shifted his focus towards next year’s global championships in London and the 2018 Commonwealth Games in Gold Coast, in the build-up to the 2020 Paralympics in Tokyo. “I really love the sport, but I feel I’ll only keep doing it if I can give 150%,” he said. For now, Du Toit will continue to focus on sprint events and he’ll only call it quits when the sport no longer brings a smile to his face.